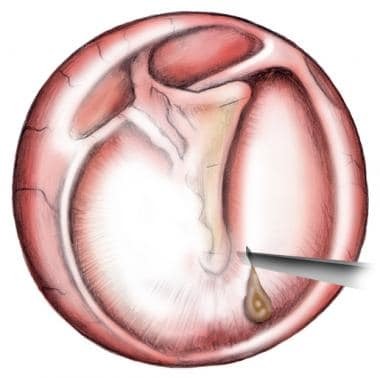 Myringotomy is a surgical procedure of the eardrum or tympanic membrane. The procedure is performed by making a small incision with a myringotomy knife through the layers of tympanic membrane (see the image below). This surgical procedure permits direct access to the middle ear space and allows the release of middle-ear fluid, which is the end product of otitis media with effusion (OME), whether acute or chronic. OME is classified as serous, mucoid, or purulent. OME may spontaneously occur as a result of inadequate ventilation of the middle-ear space related to poor eustachian tube function or a persistent inflammatory response to acute otitis media (AOM). Additional contributors to the development of OME include the immaturity both of the infant or young child’s immune system and of the anatomy of the eustachian tube. In children, the eustachian tube is shorter, more horizontally oriented, and less functionally mature, and these differences can predispose children to OME. Inflammation of the mucosa of the eustachian tube orifice (from conditions such as upper respiratory infection [URI] or allergy) and improper functioning of the eustachian tube musculature lead to negative middle-ear pressure. Thus, when the eustachian tube opens, bacteria and viruses from the nasopharynx are drawn into the middle-ear space and generate an inflammatory response. OME has a strong correlation with URI. Children with craniofacial abnormalities that affect eustachian tube function (eg, Down syndrome and cleft palate) are at increased risk for otitis media. Immune deficiency should be suspected in children with OME that occurs in association with recurrent sinusitis, bronchitis, or gastrointestinal (GI) abnormalities. The eustachian tube is the communication between the middle ear and the nasopharynx. 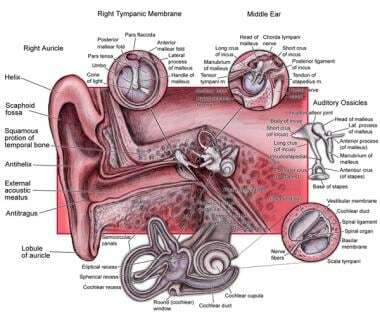 Its function is to equalize pressure across the tympanic membrane. Contraction of the tensor veli palatini and the salpingopharyngeus outside of the tympanic cavity (middle ear) dilate and open the auditory tube. 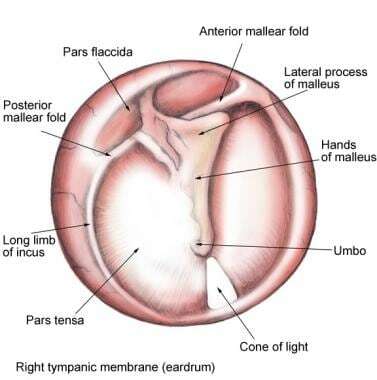 The image below depicts middle ear anatomy. Myringotomy may be indicated in cases of AOM, recurrent AOM with effusion (RAOME), and chronic otitis media with effusion (COME). Patients with AOM that is refractory to medical therapy or associated with signs of toxicity require myringotomy with or without middle-ear culture. Children with recurrent acute episodes of otitis media (usually understood as more than 4-5 infections in 6 months) benefit from myringotomy. The most common indication is for children with COME of more than 3 months’ duration. Alberti PW. Myringotomy and ventilating tubes in the 19th century. Laryngoscope. 1974 May. 84(5):805-15. [Medline]. Anil Lalwani. Current diagnosis & treatment in otolaryngology--head & neck surgery. 3rd. New York: Lange Medical Books/McGraw-Hill; 2004. Mandel EM, Rockette HE, Bluestone CD, Paradise JL, Nozza RJ. Efficacy of myringotomy with and without tympanostomy tubes for chronic otitis media with effusion. Pediatr Infect Dis J. 1992 Apr. 11(4):270-7. [Medline]. Kenna MA. Otitis Media with Effusion. Bailey BJ JJ, Newlands SD. Head & Neck Surgery - Otolaryngology. 4th. Lippincott Williams & Wilkins; 2006. Isaacson G. Six Sigma tympanostomy tube insertion: achieving the highest safety levels during residency training. Otolaryngol Head Neck Surg. 2008 Sep. 139(3):353-7. [Medline]. Mair EA, Moss JR, Dohar JE, Antonelli PJ, Bear M, LeBel C. Randomized Clinical Trial of a Sustained-Exposure Ciprofloxacin for Intratympanic Injection During Tympanostomy Tube Surgery. Ann Otol Rhinol Laryngol. 2015 Aug 20. [Medline]. Myringotomy with aspiration of mucoid fluid. Myringotomy and ear tube placement. Video courtesy of Hamid R Djalilian, MD. Myringotomy. Video courtesy of Hamid R Djalilian, MD. Acknowledgments Medscape Reference thanks Hamid R Djalilian, MD, Associate Professor of Otolaryngology, Director of Neurotology and Skull Base Surgery, University of California Irvine Medical Center, for assistance with the video contribution to this article.